This weekend I was an instructor at a writer’s conference held at the University of New Mexico. I never did find out what was Connie’s isolating factor, but I found myself thinking about how many writers I know for whom this pattern fits. Only children: Daniel Abraham, Pat Cadigan, Yvonne Coats, Paul Dellinger, Chuck Gannon, John Jos. Miller, Fred Saberhagen, Melinda Snodgrass, Ian Tregallis, Walter Jon Williams, Roger Zelazny. Eldest children: Constance Ash, Gardner Dozois, Stephen Leigh, Jane Lindskold, George R.R. Martin, Christy Marx, Suzy McKee Charnas, Sage Walker, Len Wein. Youngest children isolated because their next closest sibling was markedly older: Laura Anne Gilman, Kristine Kathryn Rusch, P. Andrew Miller, Pati Nagle, Pari Noskin Taichert, Joan Spicci Saberhagen, S.M. Stirling. David Weber is an exception who proves the rule. He’s neither an only or an eldest, nor particularly isolated, but he tells the tale of how when he and older sister were in the same college class the instructor assumed Weber was the elder because of how their family dynamic had evolved. Okay, then, why don’t all oldest or only children become writers? Well, isolation is only part of the equation. The other element is that the isolation must in some way stimulate creativity. Think of Robert Lewis Stevenson sick in bed, making imaginary worlds out of his counterpane. A child bombarded from birth with classes or cousins or sports wouldn’t get that same stimulus. Creative isolation is what I experienced. I’m the eldest of four. The first three of us were born precisely inside of three years. I’m not exaggerating. My brother, Graydon, was born on my third birthday. From one angle, that doesn’t sound like much isolation, does it? Reconsider, though. My sister, Ann, was born a bit over a year and seven months after me. However, although we would become intimate playmates, it would be at least eighteen months before she was done concentrating on building basic skills like walking and talking. Therefore, three years or more would pass before I had anyone to play with. That isolation stimulated my creativity. When Ann did start toddling about, I suspect I was the ringleader for our early games. Only later would she be a viable creative contributor. I hasten to add, she was and is very creative, not in the least the passive follower. (Maybe one of these days I’ll write about how my parents managed to do what most psychologists consider impossible: raising four “alpha” personality children). Ann and Graydon very much liked playing made-up, imagination-based games, but the day did come when they started to outgrow such entertainments. I, however, never did. To my good fortune, my youngest sibling, Susan, is eight years younger than I am. So right up until I went to college (and discovered role-playing gaming) I had someone in-house who wanted to play pretend. Needless to say, my pattern is not the pattern for all writers or even for the majority of writers. I had both the isolation in which to learn to create out of my own imagination and stimulation in learning how to share that creativity in games with my siblings. Really, when looked at that way, not only is it reasonable that I would become a writer. It almost seems impossible that I would have become anything else. I’ve run with a wolf pack. I’ve even been caught. In 2006, my friend (and fellow writer) Pati Nagle arranged a field trip out to Wild Spirit Wolf Sanctuary in Ramah, New Mexico. I was reminded of that trip when a few weeks ago when I saw some of the folks (and Forrest the wolf) from Wild Spirit doing public outreach at a gem and mineral show at the Fairgrounds in Albuquerque. I’m a long-time supporter of Wild Spirit, dating back to at least 2001, when they were still known as Candy Kitchen Wolf Rescue Ranch. That name came from their location – Candy Kitchen Road in Ramah, New Mexico. The two pictures of me with wolves that have graced my book jackets and website are courtesy of Wild Spirit. The older picture is with Raven, who died last spring. The new picture (which is still on my home page) is with a young (only eighteen weeks old) Dakota. He’s gotten a whole lot bigger since then. Anyhow… I was going to tell you about running with a wolf pack. Although we’d visited with Wild Spirit’s ambassadors at events in Albuquerque – Pati and I had even shared book signings with them – we’d never been out to their facility. We’d already signed our paperwork (there are various releases required before touring the facility) and so without delay we headed out to the grounds. First stop was a large pen that swarmed with young wolves. They were wonderful, just moving out of the fat roundness of puppyhood into the leggy adolescent stage. As we admired them, Leyton explained how Wild Spirit had been contacted twice in close succession by facilities that had raised wolves for the pet trade. (This is illegal in many states). These facilities were closing down and inquired if Wild Spirit could stretch to take in the pups. Wild Spirit agreed and here were the results: eleven young wolves from two different families. One litter represented the grey and brown timber wolf. The other litter represented the white Arctic wolf. At first we couldn’t believe our luck, but we readily agreed. We were warned to take off anything that might get pulled off – cameras, hair ties, loose jewelry. To keep the pups in, Leyton explained, they had a dual door system, sort of like an airlock. I agreed. A moment later, there I was, running for dear life, a bunch of eager wolf pups nipping at my heels, bouncing up and down, and generally having a great time with their new toy. As the rest of our group came through, they went over to bounce them and I got to catch my breath. I’m not going to sugarcoat here. Even at eighteen weeks or so, these were not little puppies. They were about the size of German Shepard dogs, although less massive through the body. We all picked up our share of bumps and bruises. Pati (knowing how camera shy I can be) had decided to risk her camera and brought it in with her. That’s where the wonderful picture of me and Dakota comes from. It’s the only picture of myself I have in my office – a memento of a very happy experience. Bumps and bruises included, I don’t think any of us regretted our choice. The rest of the tour, although not as “hands-on,” was wonderful. We were told the life stories of many of the wolves and wolf-dogs who live at Wild Spirit. In many cases, the rescued animals had escaped being destroyed by mere hours. 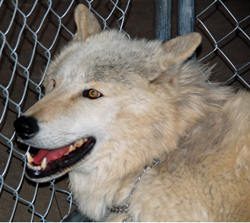 We also learned a lot about wolves both in captivity and in the wild, including the tendency toward “neophobia” (fear of something new) that contributes strongly to making wolves and wolf-dogs unsatisfactory pets. We also saw how the humans at Wild Spirit make an ongoing effort to give each and every animal under their care the best possible living situation. I highly recommend a tour. If you can’t make it to New Mexico, then at least visit Wild Spirit’s website. You can sign up for their newsletter and hear stories about both the wolves and the people who have given over a big chunk of their lives to make sure these otherwise homeless animals have the best home possible. whirling past my office window, carried in winds gusting up to forty miles an hour. Yesterday there was hardly a breath of wind. I was outside for most of the day doing yard work, first over at my friend Chip’s, then in my own yard. Today I’d go outside at the risk of stinging sandburn, accompanied by grit in my eyes and mouth. Welcome to Spring in New Mexico: violent, unpredictable, and not really very pleasant. Even so, for a gardener like me, Spring has an undeniable appeal. Non-gardeners think that gardening has something to do with plants. Gardeners know that the real appeal is dirt. Dirt is what makes the plants thrive, dirt and water. Unfortunately, where I now live, both are in short supply, so the gardening season starts with making dirt. I wrote something about this back in late January’s entry, “A Thin Dark Line.” As of now, Jim and I have dug and filled three compost trenches. Number four remains open, but will probably be filled this coming weekend, weather permitting. We’ve also gone out and hauled horse manure to enrich the sandy soil in our four raised beds – enough sacks to fill the back of our small pick-up truck. If the weather is nice this weekend, I think we’ll be collecting another lot. That should about do it. If the weather is promising, we may also get our first lot of plants in the ground. We’ve been experimenting with growing more vegetable plants from seed. We’ve always done our cucumbers, squash, beans, Swiss chard, and many non-perennial herbs from seed. 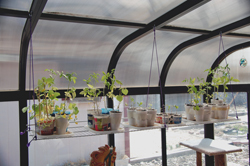 However, the closing of local greenhouses we relied on for interesting varieties well-suited to our weird climate and relatively short growing season has led to our trying to grow tomatoes, peppers, and eggplants from seed. So far the tomatoes and eggplants are doing well, but the peppers are lagging. I’ve been assured that the peppers will do well when temperatures hit the eighties. Right now we’re still in the sixties and seventies, although it’s hotter on our sun porch where we put the plants out during the day. They hang from the ceiling above cat-tampering height, set on a rack Jim suspended with purple string. It’s actually quite festive looking – especially since the cucumbers have decided to start flowering. (Yes. I know the cukes probably won’t transplant, but Jim did so want to try and this is a collaborative effort). Why do I go to so much trouble when there is a good grocery store a mile and a half from my house? When there are farmer’s markets and natural grocery stores? No. It isn’t about cost. It isn’t about taste, even, although that does come into it. Honestly, I garden for much the same reason I read and write Science Fiction and Fantasy – for the sense of wonder. There’s nothing like the feeling I get when I see a tiny sprout break the soil. Or when a flower turns into a fruit. Or when I bite into a tomato still warm from the sun: a sweet and tangy miracle of transformation. As I savor the taste, I remember that this all started with dirt, water, and a little enigma called a seed. Sense of wonder. Yeah. Gardening. When a story comes together. More alike than you might imagine. A few weeks ago, in a comment on my “What’s in a Name?” entry, Alan Robson mentioned Enchanted Glass, a new novel by Diana Wynne Jones. I immediately made a note to go out and get the novel, since I am a great admirer of Ms. Wynne Jones’ work. Then I responded to Alan’s comment by mentioning Ms. Wynne Jones’ marvelous The Tough Guide to Fantasyland. When Alan responded again, I was tempted to add yet another comment. However, I could see we were about to get into one of those nice, juicy book conversations that can be such fun to share. So here I am. Before I get started, I want to say that I have never met Ms. Wynne Jones. I sat behind her once at a convention. I was too shy to introduce myself. So I’m not pushing the works of a friend, just enthusing about someone whose novels I have admired for many, many years. The first novel by Diana Wynne Jones I encountered was a contemporary fantasy entitled Dogsbody. How do you describe a book that is told mostly from the point of view of a dog, that features celestial bodies as characters, and that includes among the challenges the characters face house cats, sibling rivalry, otherworldly assassins, the Wild Hunt, and IRA terrorists? So now I’ve said it. If Dogsbody is perhaps my favorite of Diana Wynne Jones’ books, this does not mean Diana Wynne Jones has not written other wonderful books. Part of what delights me about her work is that it is not all the same. Some of her works (like Dogsbody) are more or less serious. However, she has a twisted perspective that lets her see the world sideways and inside out. Then she writes about the most outrageous subjects in a completely matter-of-fact, deceptively simple prose. Except that the young lady in question actually discovers that being an old lady isn’t all bad. She discovers some new freedoms, some interesting things about herself. To say more would be to rob a new reader of the pleasure of discovery. Diana Wynne Jones wrote novels about a magical world within our world long before J.K. Rowling introduced us to Harry Potter and his friends. The Chrestomanci books, which include Charmed Life, Witch Week, and The Lives of Christopher Chant (and others) investigate this environment in a series of interlocked tales. She has also written more traditional imaginary world fantasy in her intricate Dalemark Quartet. (The first novel in the series is Cart and Cwidder.) Then she turned the same genre on its ear in her wonderful Dark Lord of Derkholm. And now for The Tough Guide to Fantasyland. Is this fiction or not? I’m not sure. Formatted as a travel guide to some generic Fantasyland, this book gently and affectionately skewers the cliches and set pieces of the genre. When writers come to me and say, “I want to write Fantasy. What courses should I take? What books should I read?” The Tough Guide to Fantasyland is at the top of my list. Why? Not because I don’t like High Fantasy or Sword and Sorcery, and therefore want to see this sort of book mocked and people running screaming from the very idea of writing it. (Heck, I’ve read a lot of it and even written some). No. It’s because I have a strong feeling that would-be Fantasy writers (and, frankly, many published Fantasy writers) need to think hard about their world-building. The Tough Guide to Fantasyland is a crash course in learning to think about world-building. Best of all, it’s fun. I could enthuse on, book by book, through the works of this amazing writer, but I think I’ll stop here so you can go find a Diana Wynne Jones novel and experience the pleasure for yourselves.